User Review: "DashThis Builds Value and Save Money"
I have been using DashThis to run weekly and monthly reporting for all agency clients. Currently we have about 13 clients running DashThis dashboards, and we're growing. Additionally, at a previous company we deployed over 100 dashboards for clients. DashThis provides key decision makers at client companies to see their most important KPIs without having to dive into Google Analytics. We provide deep insights on practically any marketing channel through the dashboard with API integrations. High-Level Executive Reports for Easy-to-Disseminate information. Provide the most important metrics quickly. Currently it's missing Amazon Ads integrations, which I have submitted a request for. There should be options to transfer dashboards to other accounts, as needed. For example, when a client engagement ends, being able to transfer the dashboard to the client account would be cool. I'm sure the capability exists. Offline-reporting capabilities or sending PDFs through email of the dashboard may be very valuable to people reviewing data that don't currently have internet access. I have used DashThis with all my clients, because it is the fastest, easiest, and best-developed reporting platform. I have tried Google Data Studio and many other reporting integrations, but they just don't have the speed or capabilities of DashThis. With in-depth filtering, you can create reporting modules not available in any other dashboard, like deep source-medium targeting or landing page data, etc. Whatever data you need, you can get access. Their API integrations are increasing all the time, and if they don't currently connect to something, request access. User Review: "DashThis - Simple, Easy & Limited"
I use DashThis to visualize data and set up dashboards for reports that I need to generate on an ongoing basis. It requires a one time setup to link data sources and create the template that fits needs. The platform then automatically updates the dashboard every new week/month and cuts down the reporting time significantly. DashThis can be a useful tool if you are working with a small data set that is already cleaned up an does not require any manipulation. However, if you are dealing with a situation that requires data clean-up, custom visualization and you need to slice and dice the data then DashThis is probably not a suitable tool to use. DashThis Review: "Great for Small and Mid Sized Businesses"
DashThis is being used company-wide to track and monitor key client metrics month over month. We've dumped just about every app and resource site's data into it, creating a one-stop shop for analysis. 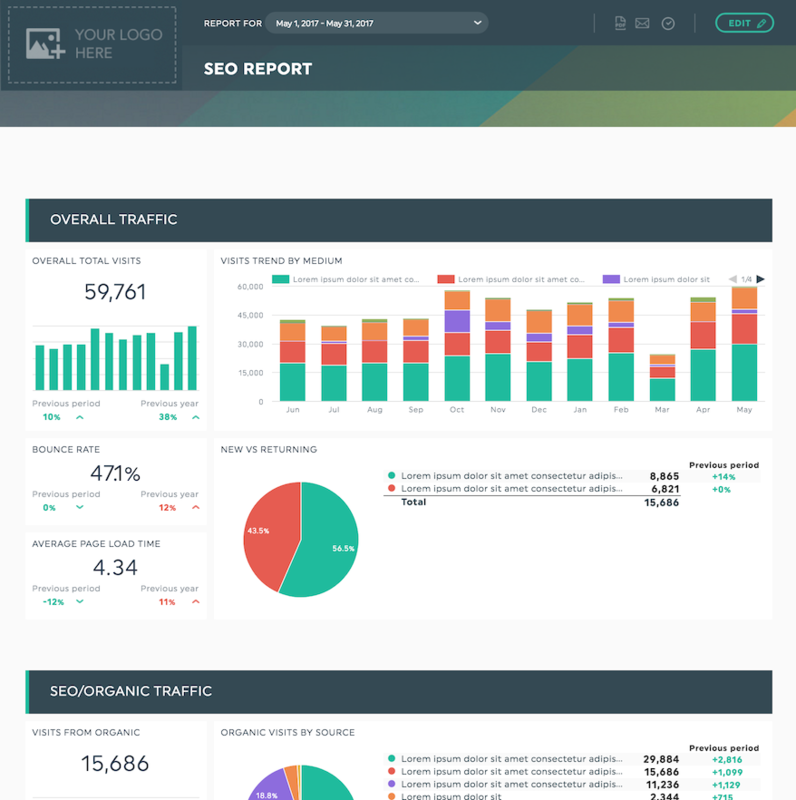 From email, to paid search, to social media to website traffic, DashThis has provided a simple solution for providing a complete analytics database. Previous programs we have used are very siloed, and while they are helpful it's difficult managing 5 different apps and sites to get the monthly information we need. Simple drag and drop interface. No complex programming or integrations needed. Easily accessible. Save time, trees, and money. Every month we simple forward a dashboard link to our clients. No complex reports necessary. I'm interested in implementing more tools into the system, such as Google My Business or OpenTable to truly make it a universal analytics dashboard. Instead of just month over month date ranges, I would also like to see a YTD date range. DashThis has worked well for us because many of our clients can't afford hours and hours of reporting and analysis fees. This has cut costs for both our agency and the clients, all while providing useful information. For our larger clients, some additional information and work is still needed to provide the whole picture so I'm not sure what our next steps will be to accomodate that. User Review: "Dash out and buy DashThis!" Our digital marketing department uses DashThis to provide easy-to-understand reports to clients each month. It saves time since most reports can be updated automatically and provides a unified, streamlined look for the client, allowing them to quickly check how their website and digital marketing efforts are performing all in one place. I'd like the ability to archive a report so that it doesn't count against my dashboard total. There are a few reports we're not likely to use again, and if so we would gladly upgrade. But I'd hate to delete them just to free up space. This is REALLY minor, but it would be nice to have more flexibility when uploading a client's logo to a report. Right now I have to resize it and add a transparent background if it's not the right shape to get it to the right dimensions before I can upload. It would be nice if they allowed for different dimensions. It's great if you have to provide reports (either internally or for clients) on a regular basis. It takes a little time to set up your structure (surely comparable to the time you'd spend in another tool and definitely faster than doing it manually), but then it saves so much time on an ongoing basis. It's also really important when you want your reports to look good -- which is pretty much all the time! No more Word documents here and Excel spreadsheet there with mismatched formatting all over the place. Now you can have one streamlined look, which allows you to view the data more easily and not get tripped up on the report itself. Honestly, I think it's appropriate in pretty much any situation! I guess maybe if you were just pulling one report one time, then it might not be worth the time it takes to set up, but even then it depends -- you still have the benefit of one clear, streamlined look for all your data. And it's less error-prone. 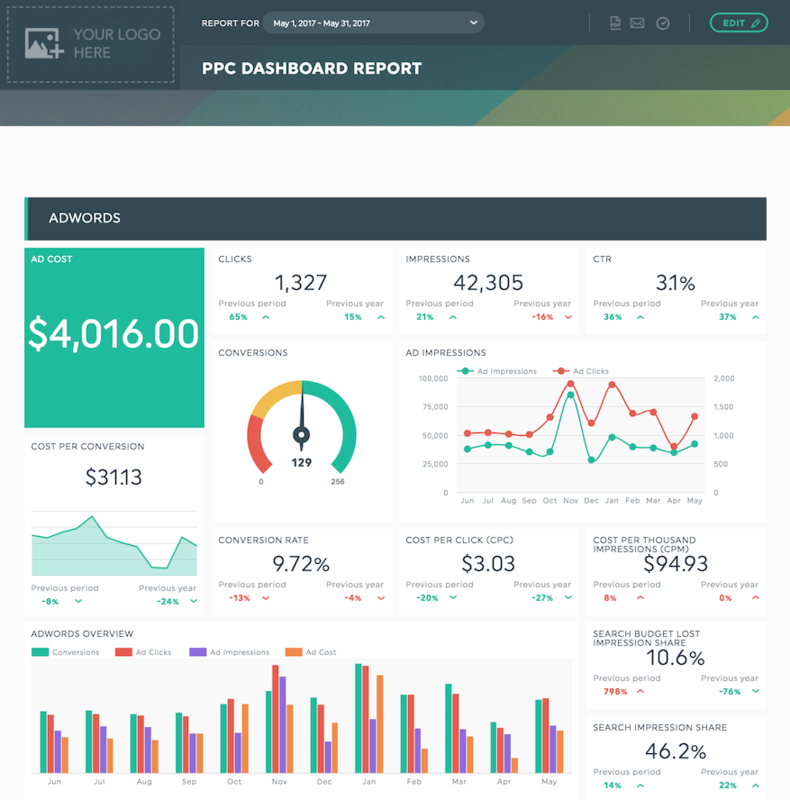 DashThis is a digital marketing reporting tool with no complicated "extra" stuff. DashThis integrates with over 30+ data sources, and also has a nifty CSV File Manager that helps users add any other data they might want to include in dashboards. According to the vendor, customer support is a top priority. DashThis provides a dedicated member of their team that makes sure users are up and running in no time, and is always available to answer questions whenever needed. Prices are based on the number of dashboards users have. All pricing plans include all available features, unlimited users, an an Account Manager.